Some heavy users of marijuana show signs of withdrawal when they do not use the drug. They develop symptoms such as restlessness, loss of appetite, trouble sleeping, weight loss, and shaky hands. Some people feel nothing at all when they first try marijuana. Others may feel high (intoxicated and/or euphoric). Some scientific studies have found that babies born to women who used marijuana during their pregnancy display altered responses to visual stimulation, increased tremors, and a high-pitched cry, which may indicate problems with nervous system development. Street name and slang terms for marijuana: Blunt, Bud, Chronic, Duby, Grass, Herb, Mary Jane, Pot, Weed. Hashish consists of the THC-rich resinous material from the cannabis plant. In general, hashish is stronger than weed. Producing hashish requires separation of the resin from the flowering tops of the plant by drying and cooling the plant. After that, the plant is filtered. The plant is processed and the small resin grains fall through a sieve. This process can be repeated several times. It is then crushed into powder, by hand or with the help of a press. The oil that comes free causes the powder to stick. It is then molded into a brown slice. Both hashish and marijuana originate from the female cannabis plant called cannabis sativa. Small resin glands are situated at the flowering tops and upper leaves of the cannabis plant. The resin attracts pollen and contains THC. THC is the active ingredient of hashish and marijuana that abusers of these drugs seek for its effects. Its color can vary from green, black, reddish brown, or most commonly light to dark brown. Hashish is actually pure resin. It is often compressed into a variety of forms such as balls, cakes, or cookie-like sheets. Pieces are then broken off, placed in pipes, and smoked. 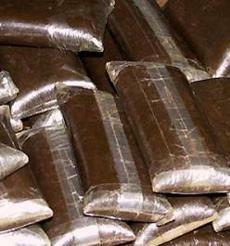 The Middle East, North Africa, and Pakistan/Afghanistan are the main sources of hashish. It is consumed in much the same way as cannabis buds. It is often used by itself in miniature smoking pipes, vaporized, hot knifed, smoked in a bong or bubbler, or smoked in joints mixed with tobacco, cannabis buds, or other herbs. It can also be eaten alone (pure hash is described as having a spicy or peppery flavor) as well as used as an ingredient in food (baked into cookies or cakes, or added to stews and chocolate). Sale of hashish is illegal in most parts of the world; it has been decriminalized to some extent in a few countries, such as the Netherlands. Cravings for sweets, referred to by drug users as, "munchies"
Some users withdraw, or experience fearfulness, spontaneous laughter, anxiety, depression; users experience hallucinations, paranoia and panic reactions with larger doses and symptoms worsen in persons with psychiatric disorders, particularly schizophrenia.